There are some pieces of furniture that are truly special to their owners, typically for nostalgic reasons, monetary value, or their functional purpose. 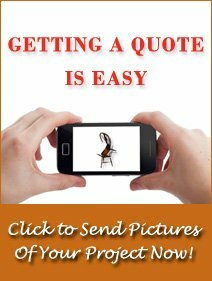 When we at Furniture Medic by MasterCare Experts have a client with a special piece of furniture that has become damaged, our expert craftsmen will do everything they can to save the piece and restore it to its original look and function. 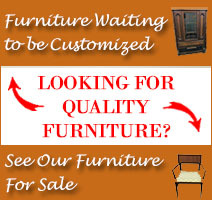 We not only specialize in furniture repair and restoration for pieces that have become broken or worn out over time, but also in disaster furniture restoration to repair furniture affected by disasters like fire and floods. We recently did restoration work on a Grundig Majestic International phonograph that sustained water damage to the finish. The client came to us with this vintage stereo to help repair the damage and provide a new finish close to the original finish. 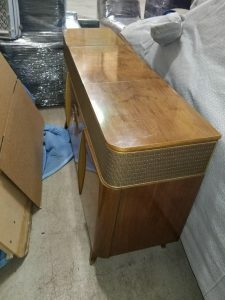 The piece had previously been fully restored and it was very important to the client that the wood panels of the stereo were restored with the right color and finish. 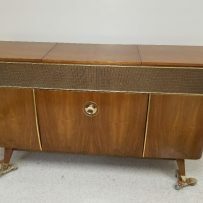 Our wood furniture refinishing experts took the job fully confident that we could return this beautiful vintage stereo back to its original look. 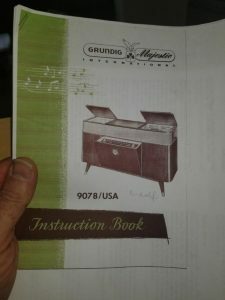 The Grundig Majestic International Model 9078 that was brought to us is a truly remarkable piece. The German made stereo features a phonograph, AM/FM tuner, and reel to reel tape deck housed inside wooden cabinets. The piece had previously been fully restored which is why the client was concerned about getting the right finish and color for the water damaged areas. The client’s insurance company suggested that the entire cabinet be restored, but the client made sure to bring it to our experts to ensure that the piece is restored properly with the right type of finish. Water damage is a very common occurrence with furniture as leaks, floods, humidity, and condensation from beverages can damage the finish and discolor the wood. Moisture can cause the finish to literally separate from the wood which leaves the wood underneath vulnerable to water damage. Wooden furniture absorbs water which often results in warping, cracking, splitting, and swelling. In the before picture, the water damage to the finish can be seen on the top panels of the piece. In this case, the moisture caused finish damage but did not affect the wood underneath. We were able to remove the damaged finish and ensure that any moisture trapped under the finish was removed to avoid any damage to the wood. We then refinished the piece with the correct color and finish to restore the stereo to its original appearance. The client made clear from the beginning that color matching the finish for the stereo was a major concern, especially since it had been fully restored before the water damage. Our furniture refinishing experts were able to match the color and finish to the Grundig Majestic International and give it a new finish that restored its original appearance. The client was very happy and relieved when the stereo was returned looking just like it had after the previous restoration. Refinishing wood furniture is a major part of our overall furniture restoration and repair services because the condition of the finish affects the appearance of the piece. We use water-based products to give wooden furniture a factory finish and we have a wide range of stains and finish colors to provide color matching or color changing services. Our wide selection of finishes makes it possible for us to change the look of a worn-out piece of wooden furniture to give it new life and ensure that we have enough finishes available to color match the original finish of a piece. In the case of the Grundig Majestic International, we were able to color match to the original finish at the request of the client. 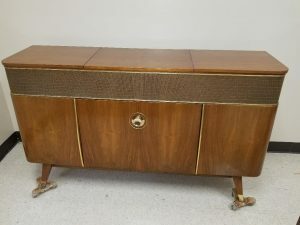 At Furniture Medic by MasterCare Experts, we were happy to restore such a beautiful vintage stereo after the finish had been damaged by water. If you have a piece of furniture that is important to you that needs to be restored, contact Furniture Medic by MasterCare Experts for our furniture refinishing and repair services. If you are concerned about having your piece restored with the right color, we can color match with our extensive selection of finishes. You can contact us about a project by calling (630) 653-3131 or submitting your project online to get started.